There’s nothing more satisfying than cutting into a rolled cake to reveal the swirl in the middle. It’s just fun. This banana bread roll is filled with a cream cheese frosting and it is delicious. The recipe is from one of my favorite bloggers and cookbook authors, Deb Perelman from the Smitten Kitchen (as if she needs introducing). In her new book Smitten Kitchen Every Day she dusts the top of the cake with confectioners’ sugar and it’s perfectly elegant. I decided to use meringue, because I just did a video series on Instagram about the 3 types of meringues, so I’m a little obsessed with it right now and figured this cake would be super fun topped with a Phyllis Diller-esque hairdo. You can watch me make this cake (and many other recipes) on Instagram in my stories (they will also live in my “highlights” archive). I’ve been teaching baking and pastry for 20 years (wow, just added that up!) and I love the new challenge of fitting these recipe lessons into 15 second segments. If you haven’t checked them out, I hope you will, I’m having a ball creating them. These may seem a little upside down, we usually think of the meringue piled high above the lemon filling, not the other way around. This is a simpler twist on the classic, but all the same tangy-sweet allure. The best part is there is no crust to deal with, which makes them lighter and faster to make. The meringue shell is whipped until it is as light as air, spooned into little clouds and baked just until they are set, but still slightly soft in the middle. Once cooled they’re topped with lavender scented lemon curd. The tartness of the curd is always a perfect match for the sweet meringue, and a bit of lavender creates a gentle floral touch, without going overboard. It tastes like spring, which I am desperately in need of on this April day, when we’re anticipating a snow storm. 1. 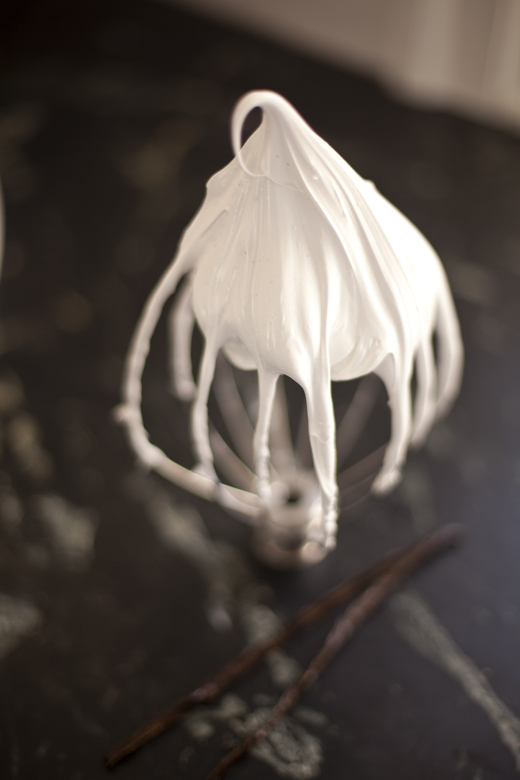 The simplest is the French meringue, which is just egg whites with sugar sprinkled over them as you whip them to peaks. If consuming raw egg whites makes you nervous, the French meringue needs to be baked to make the egg whites perfectly safe and keeps them from deflating. There are also pasteurized eggs whites on the market that eliminate any fear, but I find they don’t whip up quite as well. It is the least stable and most likely to be over whipped, but the fastest and easiest to prepare of the three types. 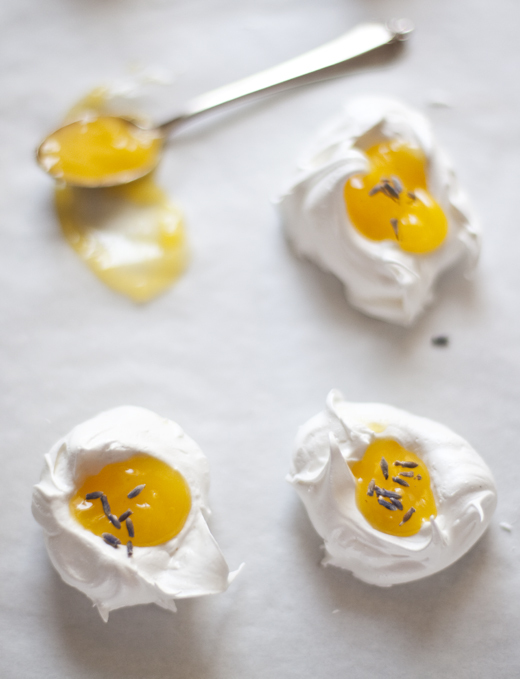 It helps to create a lofty, shiny French meringue by starting with room temperature egg whites. 2. The Swiss meringue is made by heating the egg whites and sugar together over a double boiler until all the sugar melts. This process cooks the eggs enough to make them edible without having to bake them and gives the meringue great strength. It CAN be baked (its what I used for these tartlettes) or used to make buttercream, mousse or toasted meringue topping. 3. An Italian meringue is the most stable of the three types, but also requires the most effort to create. A sugar syrup is heated to about 242°F on a candy thermometer and then very carefully poured over whipping egg whites. This creates a very stable meringue, which will hold up in a buttercream, toppings for pies and folded into mousses or Baked Alaska.